I made this for lunch today – it’s from the Barefoot Contessa Foolproof cookbook. We’ve been eating a lot of not-so-healthy stuff over the holidays and I was in need of a good cleansing dish. I had organic lettuce and beets as well as leftover goat cheese in the fridge so chose this recipe. I chose to roast the beets (tossed in some of the dressing) which allowed them to caramelize a bit. The flavours of this salad worked really great together – I’ll definitely make this again. 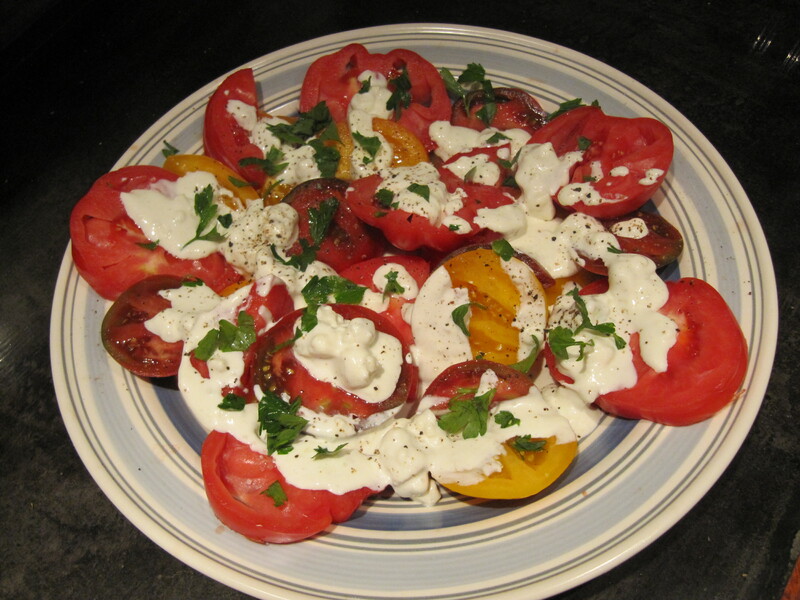 This was fabulous – the recipe is from the Barefoot Contessa’s new cookbook Foolproof. 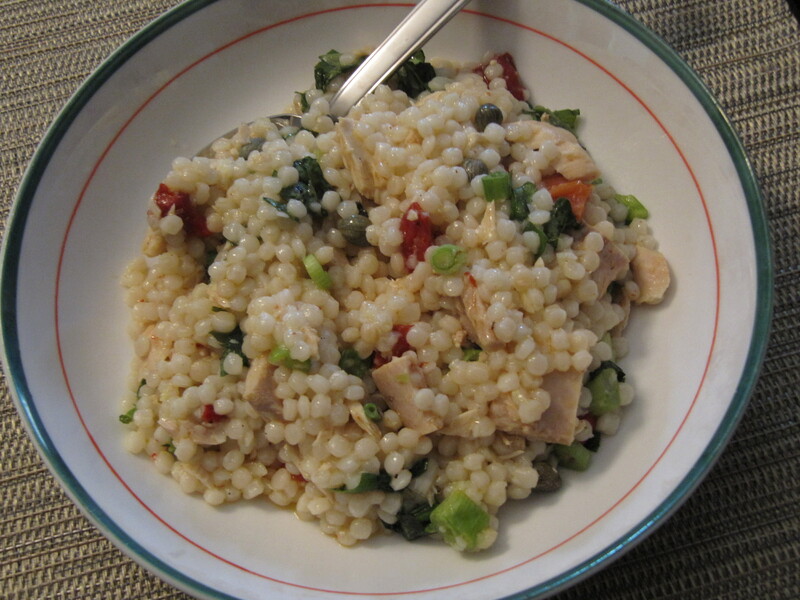 It was simple to make and had great flavours – capers, lemon, scallions, roasted red peppers, basil. A definite hit. My husband loves blue cheese. I can take it or leave it. So this recipe was right up his alley. It’s from the Barefoot Contessa at Home cookbook. The recipe can be found here on the Food Network – although that version includes lettuce as well. The one in the cookbook is exactly th same without the lettuce and the dressing is just drizzled over the tomatoes. The tomatoes were amazing. I love how heirloom tomatoes grow all deformed and funky looking and in all kinds of different colours. 🙂 The parsley was optional but I added it in and liked the freshness it added to the dish. 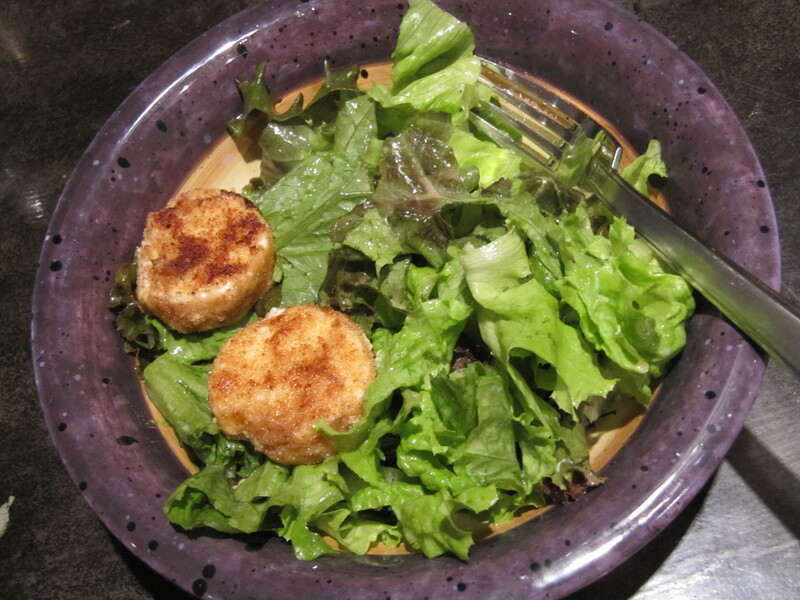 Who doesn’t like goat cheese…especially when it’s warm, served over crisp greens. Yum! This recipe is from the Barefoot Contessa Parties cookbook and it can be found here. I can totally see this as a base salad that’s great on its own, but could also be served with pears and walnuts, or cranberries and pumpkin seeds…so many options! 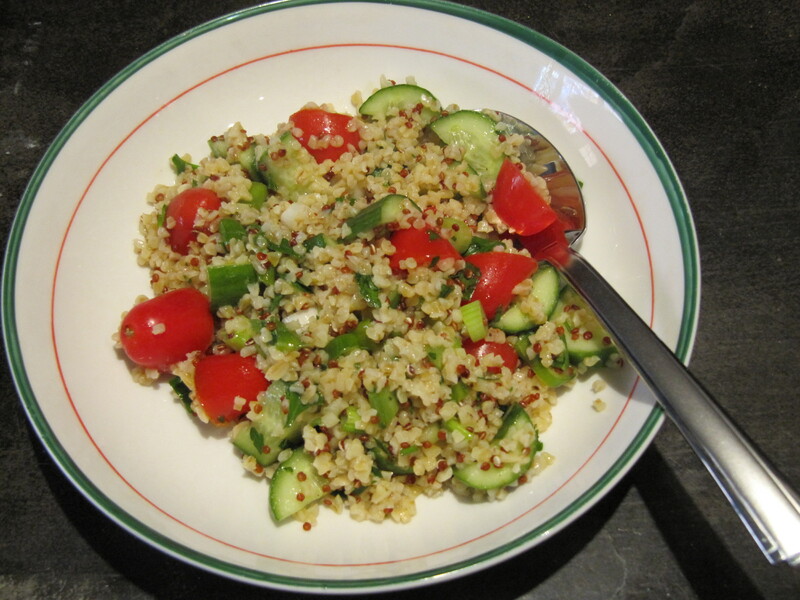 Tomatoes, cucumbers, bulgur (I also used quinoa), fresh lemon juice, parsley….what’s not to like? Eaten with hummus and whole wheat pita bread. Fantastic flavours and healthy too! This recipe is from the Barefoot Contessa Parties cookbook. I can totally see this as a salad for a buffet or picnic and it’s super quick and easy. I made this for lunch. I’ve been feeling under the weather and figured I needed as many vitamins as possible. I wasn’t able to find arugula (which is strange since my supermarket always stocks it) so I chose another lettuce. I can imagine how the peppery arugula would have tasted with this recipe though and although the regular lettuce I used was good, I suspect the arugula would have been much better. This recipe is from the Barefoot Contessa’s How Easy is That cookbook and can be found here. 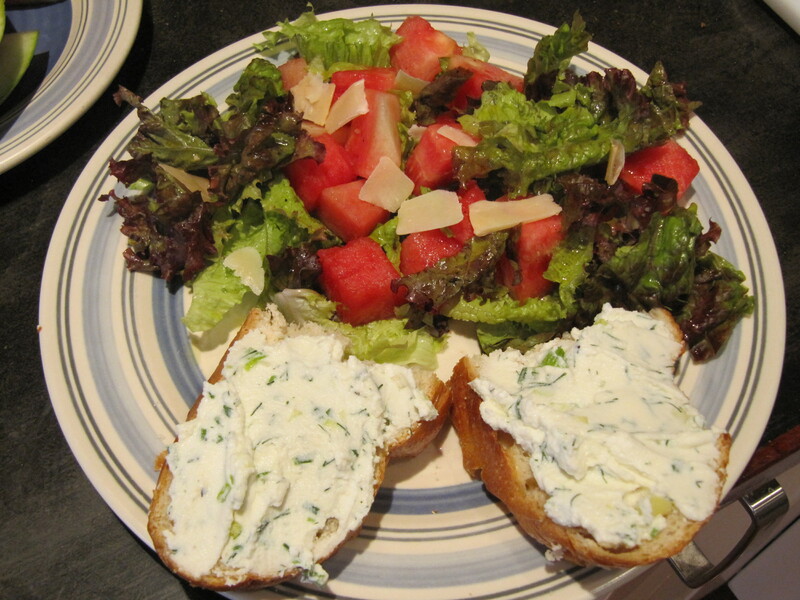 I served it with leftover Herbed Ricotta Bruschettas that I made over the weekend. After the sliders we had for lunch we wanted something lighter for supper and this fit the bill. I used store-bought low-fat ricotta instead of making it since I didn’t know how to convert the recipe into a low-fat version. 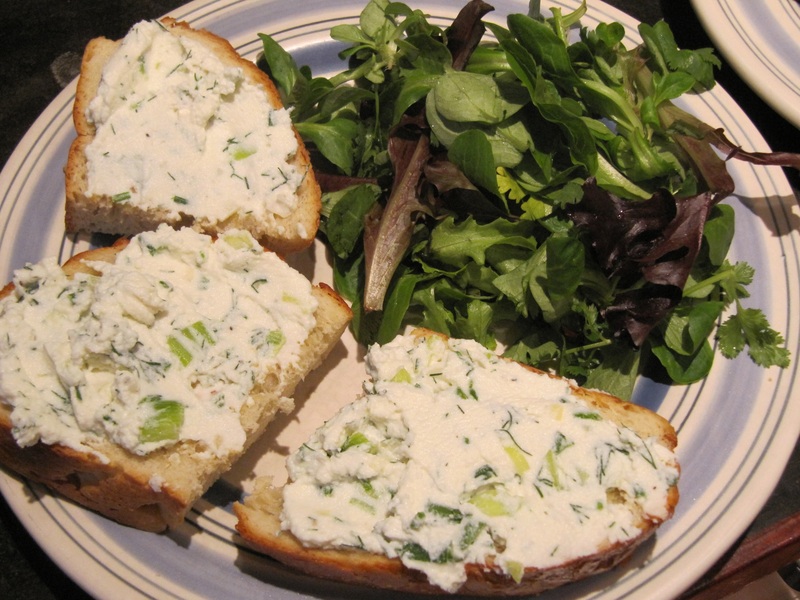 The mixture was delicious and the grilled bread rubbed with garlic was a great vehicle for it. Very tasty. I served it with a mixed green salad with the green salad vinaigrette. The whole meal tasted fresh and green – wonderful for a light summer supper. The recipes are from the Barefoot Contessa’s How Easy is That cookbook and can be found here.